Feed an artist – support me on Patreon! Masahiro, you are the worst. saviour. EVER. Look – it’s a change of scenery! 😀 Feels nice to be out of that big ol’ mass of green and red and trees. That water is freaking gorgeous <3 love the colors! Thank you! 😀 Water’s one of those things that’s incredibly difficult to paint, so I’m glad you think it’s pretty. Why isn’t Masahiro washing his sword off? wow I admire the coloring job you did for each page! Very nice panel flow, I enjoy reading it so far. Heh. 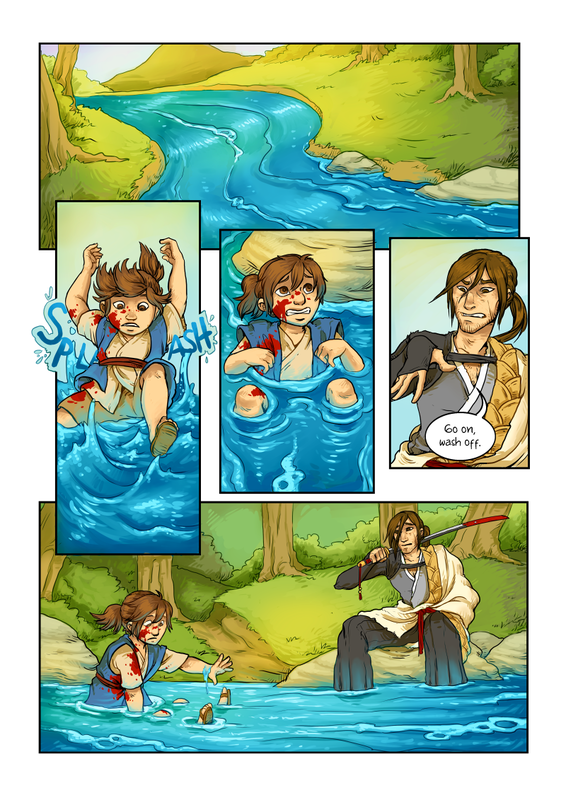 It’s like you did this page in… watercolors!